Use Tenacious Tape to patch up and repair all sorts of outdoor gear. In-field repairs on tents, tarps, rain gear, fishing gear and more. With super-aggressive stick and clean adhesive technology, and made from the same fabric as high quality tents, Tenacious Tape takes duct tape to the mat. 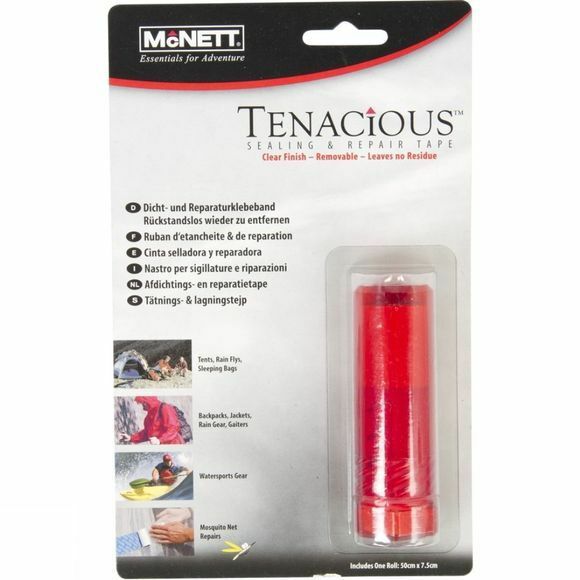 Tenacious Tape is part of a comprehensive line of Care and Repair products from Gear Aid. With Gear Aid, anyone can be a master of gear repair. Works on nylon, vinyl, netting, plastic, and breathable fabrics. Includes one 3" x 20" (50cm x 7.5cm) strip of tape, 60 sq. inches (375 sq. cm).